Soundtrack to my life… | Awesomeness For Awesome's Sake. 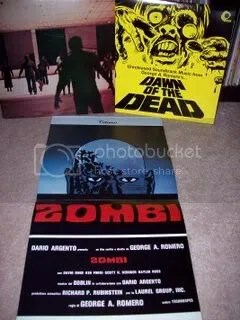 This morning I decided it was finally time to make a soundtrack section in my vinyl collection. I’ve been toying with the idea for a couple of weeks now and I took on the challenge this morning. I know all record collectors have very specific ways of filing their LPs (even if that means just tossing them around in no particular order…shudder), but I’m a hard and fast “alphabetical order” kind of Virgo….so making a section, any kind of section goes against my nature. It’s all, alpha by artist and alpha by title if it’s a soundtrack or compilation, all the time. 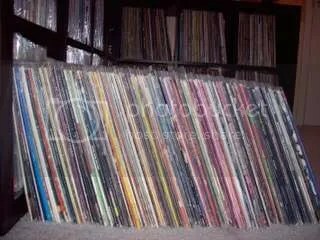 That’s about 125 lps…all soundtracks for movies or teevee. THE HORN MEETS THE HORNET by Al Hirt….It has the Green Hornet Theme plus other themes like, Get Smart, King Kong (ABC-TV Series), Tarzan, Batman, and a few others. SUPERMAN AND OTHER GALACTIC HEROES by Meco…Side one is Superman stuff but side two has The Boy Wonder, The Caped Crusader, Lord Of The Jungle, and The Amazing Amazon. SUN RA VS. DAN AND DALE…This is all crazy Batman themed songs. 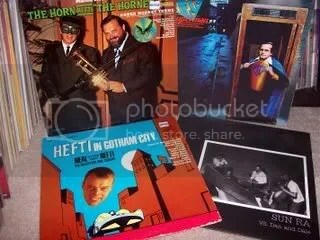 HEFTI IN GOTHAM CITY by Neal Hefti….again, all Bat-tastic songs. So what’s the problem? How do I file these by title or even by a specific soundtrack when the first two have multiple themes? I settled on putting the last two in the B’s for Batman and filed Al in the G’s for the Green Hornet and Meco in the S’s for Superman. This may not seem like a big deal to you, but they’re not your records…and you don’t have to worry about finding them. Okay, enough complaining. While pulling out all these gems I found some cool ones to share with you. The 12″ for DR. DETROIT by Devo! God, I loved this movie as a kid! Man, that track gives me goosebumps every time! Anyway, I’m glad i have a soundtrack section and I’ll probably do some more sharing with you kids in the future…but until then, I gotta’ find me a copy of DR. DETROIT on dvd, stat! Um, where in the hell is The Forbidden Zone soundtrack? Or Streets of Fire? Tsk muthafuckin’ tsk!